Discussion in 'Patriots Draft Talk' started by BobDigital, Oct 13, 2018. I guess I thought he would do more post-Gordon relapse. He has had some big plays with two touchdowns in the playoffs, but hasn't shown the ability to pick up chunk plays with any consistency. I think all season he had the opportunity to supplant Hogan as the #2 receiver and couldn't do it. It’s always hard though when we don’t really have a #1 WR. Why all the love for Dorsett? He runs a limited route tree and he is terrible at tracking the ball. He can’t high point passes. He is completely afraid of contact and tough as wet toilet paper. Unless a pass falls in his bread basket, he is worthless. Dorsett still hasn't reached his ceiling so hard to tell, but Hogan was a very good #3 until this season, 12 hasn't looked his way until recently, odd...People forget Hogan was initially brought here to extend the field. Are we watching the same Dorsett? Think we’re going to have to agree to disagree. His catch against the chiefs he tracked that ball pretty dam well despite being hugged by the DB. He runs good enough routes and his hands are solid, I think he’s in the top 5 for catch percentage this season. The one key thing is to remember his trust with Brady. It would be a shame to see him go though. Thuney is a free agent after next year and the Dolphins will be led by Flores and apparently O’Shea. They have need for interior ol, too. Anyone think a few would be possible between the two teams? My gut feeling is that we re-sign Flowers to a big-time deal and let T. Brown walk allowing us to re-sign or sign other priority FAs. I see a less than zero % chance Brown is signed, Flowers is intriguing but in the end he leaves. The franchise tag for a left tackle is $14 million, correct? They may do that if they feel Wynn is not fully recovered and ready. I think he stays and Patriots pay him a lot due to rising cap. Brown I agree. Don't see if at all after what Solder got last year. So we trade a third for brown. Play him for a year to hopefully win a super bowl and then lose him in free agency and get a third round compensation pick for him. We traded our 3rd (#95) and received Brown (for possibly just one year) and #143, basically a round-and-1/2 later, and which was used to select Bentley (though I would've selected the more highly-regarded and much more athletic Genard Avery). Seems like a sweet deal for us, no matter of you slice it. That's my thinking. It's good business. Trent Brown is a MUST resign for me - this offensive line is the biggest strength of the team and we need to keep this unit together as TB ages and to set up the run game for Michel. 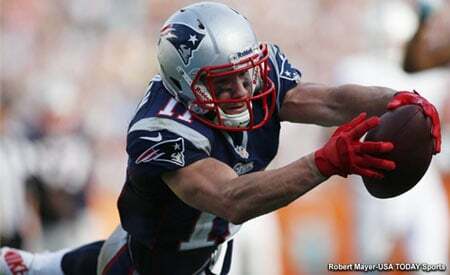 - TE: Even if Gronk comes back next year, we need an athletic TE. Keep Gronk as a primary blocking TE. Really want Hockenson from Iowa. - DT: Expecting Shelton gone, maybe Brown comes back on a cheap deal. Need an upgrade here. Resign: Trent Brown, Cordarelle Patterson, Trey Flowers, and Gost. I like Dorsett, but he has been too inconsistent. I would bring him back but I think someone will pay a lot more than us. Can you elaborate on Dorsett's inconsistentcy. It seemed to me caught nearly every ball thrown to him and did a decent job blocking. Not too excited about Tavon Austin. Ansah is injured every year. Earl Thomas would be great if healthy but not convinced that's the case. Trent Brown needs to be on this list. I want him and Flowers both but if we only get one, I think I want Brown. Ansah would need a medical clearance and more for me to think about it. I'd love to see Barr here, would give us a more athletic LB core, but not to worried. Not a big Harmon fan. Chung and McCourty getting long in the tooth. Think Chung is great. Never been convinced of Macs value at least for what he was paid. For Harmon's cap hit, he's good. D-Mac contract will be reconstructed. Harmon and D-Mac, understand how the defence works and helps younger players.Like they have done with JC Jackson, Obi.